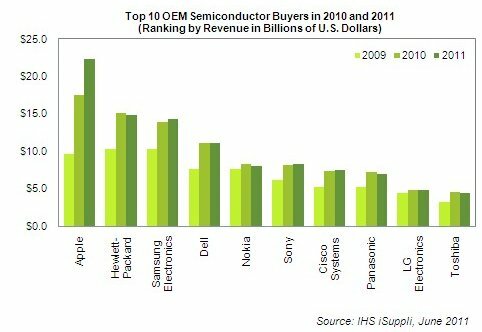 Spurred by booming demand for the iPhone and iPad, Apple Inc. in 2010 became the largest buyer of semiconductors among original equipment manufacturers (OEMs) for the first time ever, new IHS iSuppli (NYSE: IHS) research indicates. Apple in 2010 bought $17.5 billion worth of semiconductors, a 79.6 percent increase from $9.7 billion in 2009. This represented the highest rate of increase among the world’s Top 10 OEM semiconductor buyers, allowing Apple to rise up two positions to take the No. 1 rank in 2010. Apple in 2009 was the third-largest semiconductor purchaser, behind Hewlett-Packard Co. of the United States and Samsung Electronics Co. Ltd. of South Korea; it was sixth in 2008. Apple is likely to continue increasing its semiconductor spending during the coming years at an above-average pace, allowing the company to extend its lead over Hewlett-Packard, Samsung and other OEMs in 2011 and beyond. In 2011 Apple’s semiconductor spending is expected to exceed that of Hewlett-Packard by $7.5 billion, up from $2.4 billion in 2010. Apple is more a wireless devices maker than a computer maker. The company spent approximately 61 percent of its semiconductor budget in 2010 on wireless products such as iPhones and iPads. In contrast, 82 percent of Hewlett-Packard’s 2010 semiconductor spending was dedicated to computer products like desktops, notebooks and servers. This worked to Apple’s benefit, with the smart phone and tablet markets massively outgrowing the computer segment in 2010. Smart phone shipments in 2010 rose 62 percent, while tablets exploded by more than 900 percent, driven by the introduction of Apple’s iPad. In contrast, global PC shipments grew a relatively weak 14.2 percent in 2010. Apple’s Ecosystem Leverages Existing Apple Devices to Sell New Hardware Apple strength in hardware sales lies in its device and media ecosystem—every Apple product is connected through iTunes/iOS and is synergetic with all other Apple products. As a result, committed users of the Apple ecosystem derive more value from each additional Apple device they buy, and users have little interest in leaving the Apple realm. In other words, through a common ecosystem, Apple leverages each device to sell other devices. Rising device sales to consumers then leads to increased semiconductor purchasing by Apple. In comparison, the traditional PC business does not put heavy emphasis on the creation of an ecosystem. A buyer that once purchased a Hewlett-Packard PC would just as likely purchase a Dell PC next if the price was better, given that there is little or no value in purchasing another Hewlett-Packard.